← My heart aches . . .
On this grey January day, we celebrate Our Girl Audrey’s 68th birthday. She had an appointment in Lewes, and then we shopped for a new winter hat at Peebles with the 40 dollars that she had stowed in her sock-shaped change purse just before we left home. 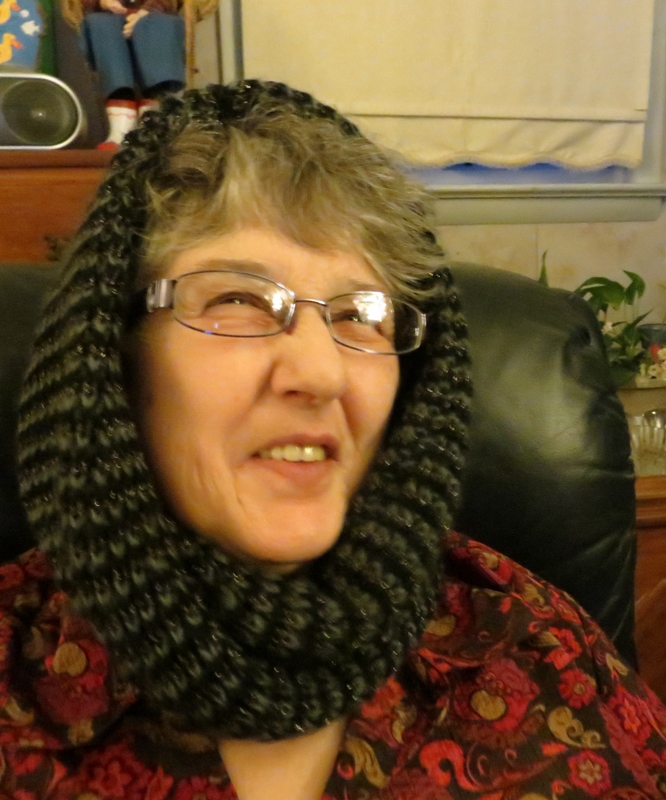 This was a big decision, but eventually we settled on a warm cowl-necked circular thing that she could pull up for a hood and she was satisfied. So was I. It looks very nice on her and the coloring is great for her hair. And then it was off for her best surprise ever. On our way to Lewes, I had told her that there was going to be another surprise for her today. Earlier, she was so pleased with her new jeans and the birthday cards she had received, plus the whole church had sung “Happy Birthday” to her yesterday, to her great delight. But this was Monday morning, and it was rainy and it was cold and she was feeling grumpy. She looked at me with skepticism dripping from her body language like the rain that was dripping from the eaves of the garage as we backed out. “A bad surprise or a good surprise?” she asked darkly. “Well, I’m not! This is a good surprise. You are going to love it! And so we went to the doctor where we waited for almost two hours past our appointment, but then got in and got out in a little bit of no time, stopped at Peebles and now were headed to Cracker Barrel, where (at least I hoped) the surprise would be waiting. She knew about going out to eat for her birthday, but she didn’t know about who might be there. We pulled up to Cracker Barrel at 12 noon. I got OGA’s walker and noticed someone waving at me from a car just across the lane. Good! Audrey came around the back of the car and got her walker and headed out to towards the restaurant. But just as she started, her sister, her only sister, stepped out of the car and began to walk towards her. She stopped, and looked disbelievingly at her beloved sister. As it registered, I thought she was going to cry. Sandra laughed and told her a big story about just pulling into the parking lot and suddenly seeing her, but Audrey, caught in the intense emotion of the moment neither listened nor believed. The truth was, I had invited Sandra last week and decided not to tell Audrey in case something happened at the last minute to mess the plans up. What a grand time we had, talking and laughing and eating in the big room at Cracker Barrel with the fire burning so brightly. I learned things about Our Girl Audrey’s family that I had never known, and Audrey reveled in the presence of her sister and this “best gift” — that her sister came to Lewes to surprise her for her birthday. When the waitress brought a piece of Coca Cola cake and some ice cream and had some of the staff sing “Happy Birthday” to her, Audrey’s delight was complete. Then we finished up, and when I went to pay the bill, Sandra already had it in her possession. “I’ve got this,” she said. “I have a gift card and I want to pay it. You can leave the tip, but I am going to pay.” We had some discussion, causing her to produce the card to prove that she did, in fact, have it in her possession, and I finally gave in. “Besides,” she said, smiling across the table at Audrey, “It’s Audrey’s birthday and I don’t have a present. This is something I can do for her!” This pleased Audrey exceedingly much and we gathered our belongings, and headed home. The rain pelted down, and the day was grey, but beside me in the mini-van, Audrey rode happily and contentedly. Such a happy day for Our Girl Audrey. She told me tonight that it was her happiest birthday ever. “Yeah, she did. Had birfday cake,” she acknowledged. “You got ‘at right. It was because I got to see my sister.” And she smiled her sweet smile. Happy Birthday, Our Girl Audrey. I hope you have a grand many more! How very, very precious!!! And I love that sweet picture of Audrey!